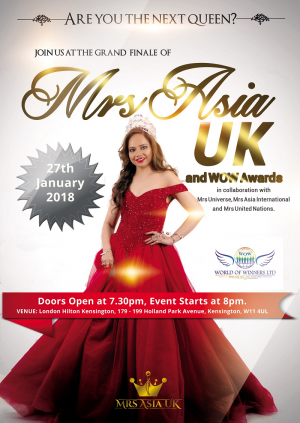 Mrs Asia UK and WOW Awards are recognising excellence of asian people in the UK. It’s a platform showcasing talent of people and allowing them to shine their light. Rachanaa Jain is founder of Mrs Asia UK and WOW Awards as her mission is to Empower, Educate and Enlighten people and help them identify their true potential to turn their dreams into reality. Mrs Asia UK has colloborated with Mrs Universe, Mrs Asia International and Mrs United Nations.